An awesome Infographic from fastcodesign.com on How Bikes Can Save Us! As countries are becoming ever more car orientated, their citizens are feeling the effects at their waist-lines, wallets and watches. The sedentary lifestyle that commonly comes with a heavy reliance on powered vehicles is costing individuals, companies and countries huge amounts of time and money. 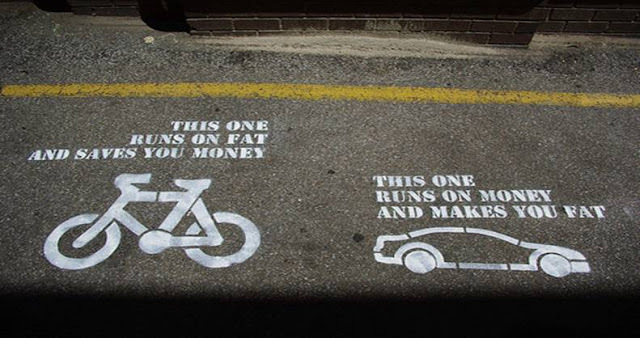 Everything for wasted hours in traffic jams to ever increasing medical expenses due obesity rates can be positively influenced by MORE PEOPLE RIDING THEIR BIKES!! 20 bikes can be parked in the space of 1 car. An MIT study in France found that bikes are up to 50% faster than cars during peak hours of traffic. By adding 30 minutes of cycling to your day, one can save up to US$544 annually in medical expenses. Singapore is a city-state of a mere 710 square kilometre (sqkm), home to 5.3 million people. That is 7,315 people per sqkm! To give you some perspective, Victoria (Austraila) has 237,629 sqkm to house a similar population. Consequently Singapore has never had the opportunity to gain any sort of agricultural independence, instead relying on nearby countries to meet their fresh produce demands. To address their heavy dependence on foreign imports, Mr Jack Ng, founder of Sky Greens decided to develop a vertical hydroponic farm on Singapore's own soil. 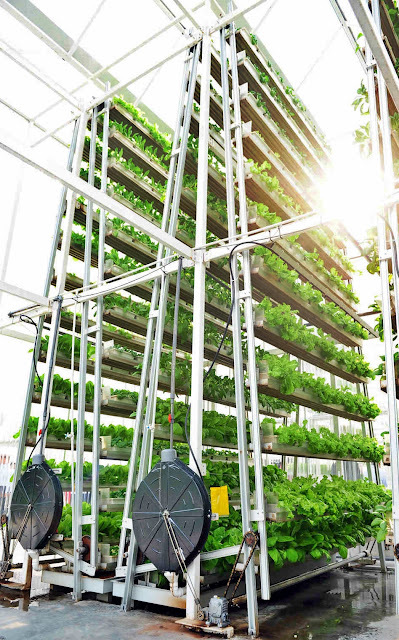 Think library-sized greenhouse with racks of cascading vegetables instead of books. At a local community park I found this; it is solar charge station for electric vehicles! A government initiative and part of the Victorian Government Electric Vehicle Trial, this station is available to the general public providing them with a spot to charge their electric vehicles. The trial was established to better understand the process, timelines and barriers for making the transition to electric vehicle technology. A quick and easy Infographic breaking down visually, the energy consumption of various items found throughout the home (given in avg monthly kilowatt hour, kwh). From the iron at 5 kwh to the swimming pool pump at 720 kwh it gives us a clear a concise overview of where the energy we pay for goes in our house. Some people way not know but spatial heating it commonly the most energy hungry consumer within a household. This reinforces the necessity of quality and comprehensive insulation in the home. Not only can you save money on energy bills but keep your house warmer more easily! A few months ago I built a balcony garden out of an old fence [link]. It turned out really well for a first attempt and looked pretty good! However, recently it had to be moved to a new house. It survived the move and I was pleased to find most of it was able to fit on the new balcony! With a bedroom on either side, it has turned a dull, disused space into a nice green space distraction! Copyright Urban Growth by Oliver Emary. Powered by Blogger.